This has very little to do with warehousing, storage, or material handling – the normal stuff you’d see on this blog. It has everything to do with the debt we owe our veterans as the long weekend approaches. This certainly isn’t original on our part, but it’s about the most apt thing I can think of to say. 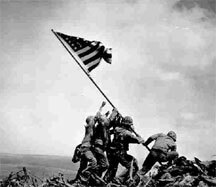 If you served, or have family who have served, thanks. We owe you everything. This is great news for small business. How great? All businesses that purchase or finance less than $800,000 in business equipment should qualify for the Section 179 Deduction. To qualify for the Section 179 Deduction, the equipment purchased must be placed into service between January 1, 2010 and December 31, 2010. The list of qualifying equipment includes machines purchased for business use, vehicles, computers, and property attached to your building that isn’t part of the structure (essentially, most material handling equipment). For more information, check out the Section 179 website – it has lists of qualifying companies and an online calculator that helps you figure out your position. As always, see a tax professional to ensure your company and purchase qualify. Please Note – The HIRE Act does not extend the 50% bonus depreciation that was available in the 2009 tax year. We’ll let you know if there is movement toward extending that credit. www.section179.org has calculators and detailed equipment lists to help you understand how this may affect you. For more information on Cisco-Eagle’s employee ownership culture, see our ESOP area. Read more about the AACE Awards. And many customized applications of various handling equipment. We can send you a copy if you want one – just call customer service for assistance. 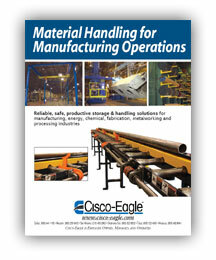 Also, check out Manufacturing Case Studies for some detailed stories of industrial applications we have executed. 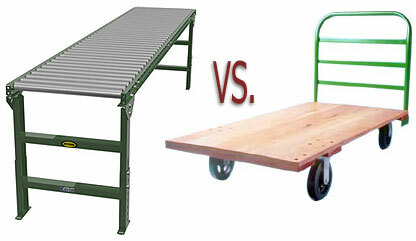 But when do you make the leap from a manual, cart-driven system to a conveyor transport system?